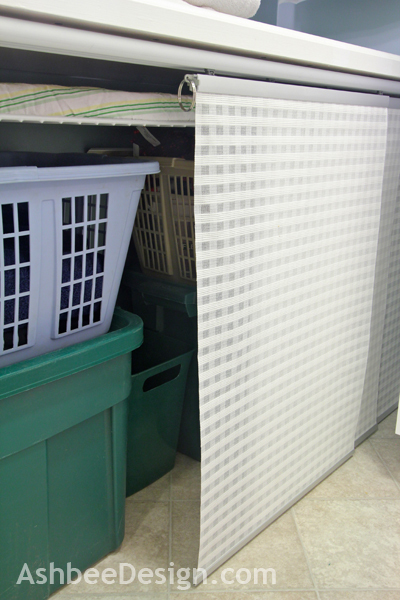 This is the fourth post in my laundry room reveal series. Click here to start at the first post. I posted back in June about many of the ideas I had found on the web. 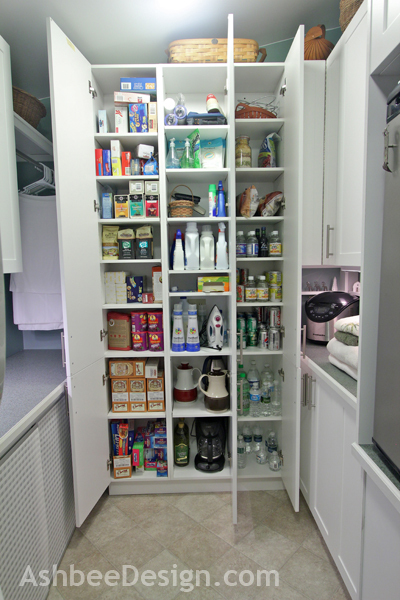 But of all those solutions, (because my space is so small and my cabinets not full depth), the only possible solution was to construct a fold out option from my middle cabinet and lose the storage in the upper half. Does it look like I have enough extra space to give up that cabinet? I didn't think so either. But once my folding counter was temporarily in place I saw a better, simpler, less expensive way. After discussions with David, we refined the idea and decided to try it out. I gave you a clue in my previous post. See that green striped object under the counter? Yup, that is my ironing board. It resides on a shelf just under the folding counter. 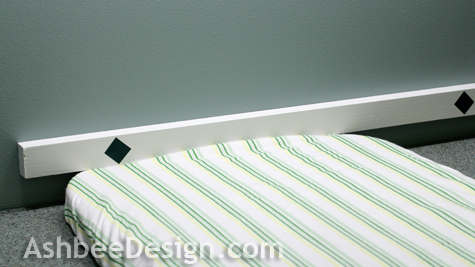 Gets placed on top and wedges under a trim board screwed into the studs on the wall. It is is easy to set up, easy to take down and works well. I had wondered if the counter would interfere with ironing and it doesn't at all. In fact, I find I have better clothing positioning because the middle legs are gone. This solution works far better than I anticipated. My old ironing board was always covered with stuff that had to be put away before I could iron. Doesn't happen with this one. Here are some of the things we did for this system to work. We removed the legs from a standard metal mesh ironing board. 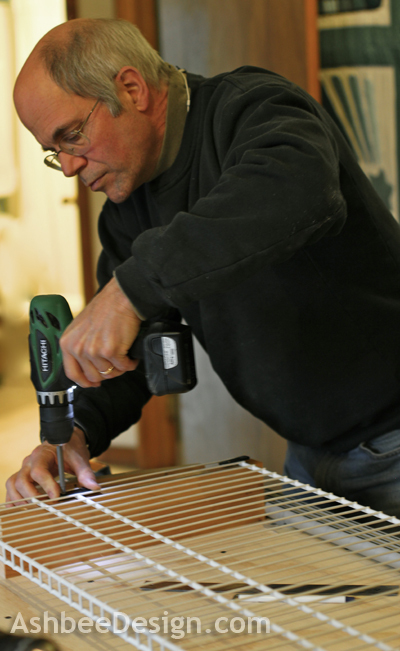 Using a piece of standard wire shelving for closets David crafted a shelf to hang below the counter. I cut a 5/4 thick piece of pine as a holding bracket for the shelf and David screwed little metal plates to hold the shelf in place. We did this before installing the counter so we didn't have to work upside down. This photo shows both the shelf and the IKEA Kvartal track system I posted about here. 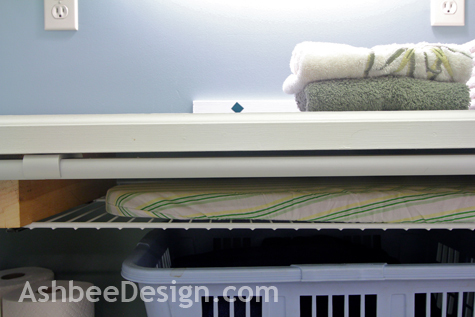 We used the wire shelf because it is so thin and we were maximizing available height for storage below. I made a bracket out of a piece of pine and screwed it right into two studs. It firmly holds the board in place. The little diamonds are contact paper that hide the screws. I could have filled them and painted over but I wanted to keep access in case future adjusting is needed. We had considered also installing super magnets but they just aren't needed. The board stays securely in place. I knew I needed an ironing board in this room and I took a risk with the design. 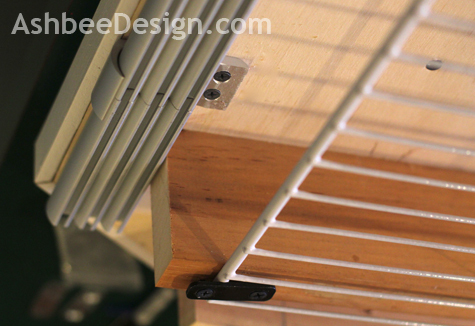 The design was finalized and that ironing board was an issue. I kept my mind open and a solution appeared as the space became defined. Keeping an open mind with a project is a skill I have been working on. Being so very concrete-sequential means I want to stick to the plan - always! I am learning the benefits of flexibility. This is a great inexpensive solution! Brilliant idea! Thanks for sharing. I liked your idea about the track rail system, too. Visiting from Between Naps on the Porch. Pays to keep and open mind! Thanks for visiting and commenting. What a cleaver idea! I saw this on DIY Dreamer and had to check it out. I have the same issue trying to store our iron board, unfortunately I don't have ANY room, but it sure was fun seeing something else figure out their space dilema. Super cute! You are a Genius!! I love to iron so I have mine up all the time well hidden in the guest room. 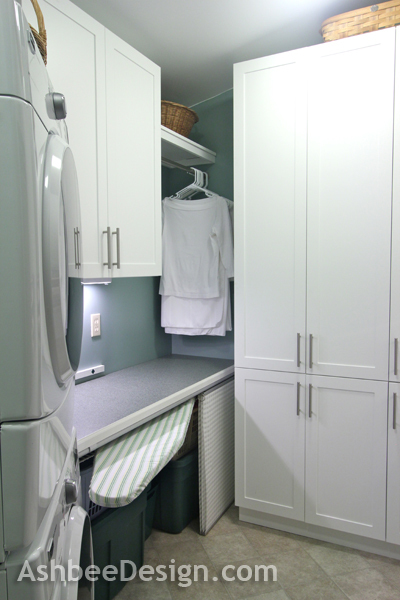 Your laundry room cabinets are so organized, they look amazing. You love to iron? Can I send you mine? 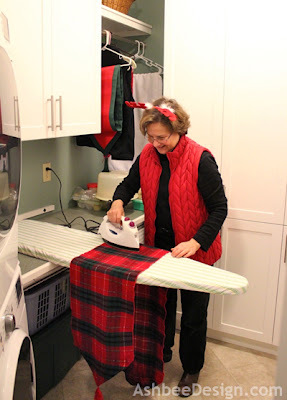 :-) I hate to iron but recognize it is often necessary. In the old laundry room there was a place for the iron to be set up all the time but it got totally hemmed in by other stuff I didn't have spaces for. I couldn't slide clothes over the end but only use the top, if I didn't haven't piled high with stuff. Both those problems have been solved in this new orientation. 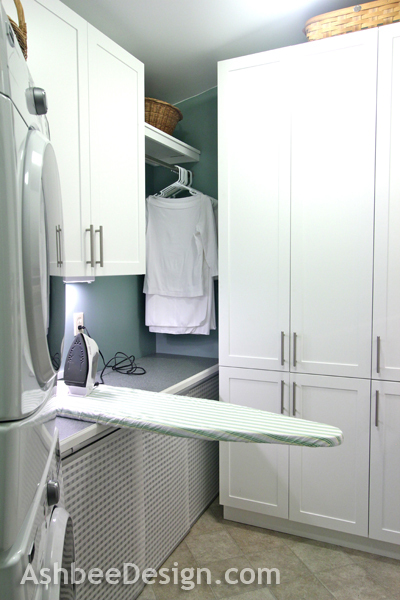 Because ironing is a secondary chore, it got secondary status in this space. Over here from DIY Showoff - what a good idea!